Texas and Oregon lead what look like the best bets this weekend. We went 3-4 on our picks last week, hitting on LSU, Arizona, and N.C. State. That moves us to 20-18 against the spread on the season. Can’t believe it is already seven weeks into the 2017 college football season. Here’s who we like for Week 7. 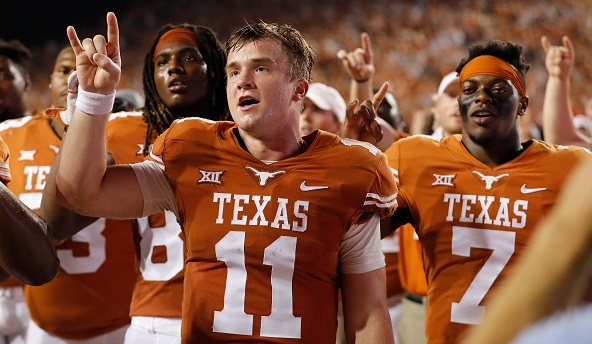 Texas has covered the last four games as an underdog in this series, with two outright wins. Tom Herman is 6-0 ATS as an underdog over his career, with five outright wins. Oklahoma’s pass defense has been firebombed the past two weeks by Baylor and Iowa State, who may be the two worst non-Kansas conference teams Oklahoma will face. Sam Ehlinger and the Longhorns will be throwing on them a lot. Oklahoma must also pick itself off the mat after what may be the worst loss in program history. Shelve the Tom Herman sledgehammer gif for this week. Hook Em. One of these teams ranks Top 10 nationally in sacks, tackles for loss, opponent third-down conversion percentage, and yards/carry allowed. That would be the Oregon Ducks. Stanford has maybe the nation’s best running back in Bryce Love. The trouble is that’s the only thing they do well, and Love can only carry the ball so many times. Oregon has not allowed a run play longer than 30 yards through six games. Justin Herbert is out for the Ducks, which will cause issues in the passing game. But Oregon should be able to run all over a Stanford defense ranking 96th in yards/carry allowed. Even if you’re high on Stanford, that’s too many points. Tigers meet Tigers. Auburn’s offense gets its yardage in large chunk plays. They have produced 14 plays of longer than 40 yards this season. LSU’s defense has been among the nation’s best at not allowing large chunk plays. Opponents have produced only four longer than 30 yards against them. It’s the best defense Auburn has faced since Clemson, which did not go well at all for them. LSU may have the SEC’s best home-field advantage. It’s not often LSU gets points at home against a team that isn’t Alabama. Take them. Indiana is a road sandwich game for Michigan. The Wolverines lost a tough game to Michigan State last week. They travel to Penn State next week. Indiana has covered both games against Jim Harbaugh and took the Wolverines to overtime the last time in Bloomington. Michigan needed two overtimes to dispatch the Hoosiers during their last trip to Bloomington. Indiana generates pressure, gets to the quarterback, and limits big plays. The Wolverines have a bad offensive line and rely on big plays to move the ball. This is an obvious letdown spot on the road for Michigan State after an emotional win over their oppressors in Ann Arbor. Michigan State’s defense has been quite good. The trouble is that their offense has not been much better than those defenses. The Spartans did not score a point in the second half against Michigan or Iowa. The Gophers have been stingy against the pass this season, ranking 12th nationally in yards/att allowed and fifth in yards/completion. Needing to set the tone on the line of scrimmage and run the ball may play to Michigan State’s mentality, but not to their strength as a football team. Arizona has at or near the most prolific rushing attack in FBS football. Their backup quarterback set the FBS quarterback rushing record last week against Colorado, on just 14 carries. UCLA has at or near the worst rushing defense in FBS football. Stanford rolled over the Bruins for 405 yards and five touchdowns on 45 carries. UCLA has not won on the road this season. Their two Power 5 wins, Texas A&M and Colorado, were by five points combined. Josh Rosen may be the nation’s best quarterback. But he has had to be to account for the disarray around him. Roll Rich Rod.